Thank you for your interest in Wetherby House Montessori. Wetherby House Montessori was founded in 2012, with the vision of providing an excellent foundation for children from the very beginning. We are set in the heart of Northwood, with four beautifully equipped classrooms, and a spacious and exciting garden. We offer quality childcare to children aged 10 months to 5 years, for fifty weeks of the year – closing only at Easter, a week in summer and Christmas. Our aim is to bring out the best in each child, allowing them to achieve their full potential. We are able to provide an entirely individualised early year’s education through creative hands-on experience in a safe, stimulating and pressure-free environment. 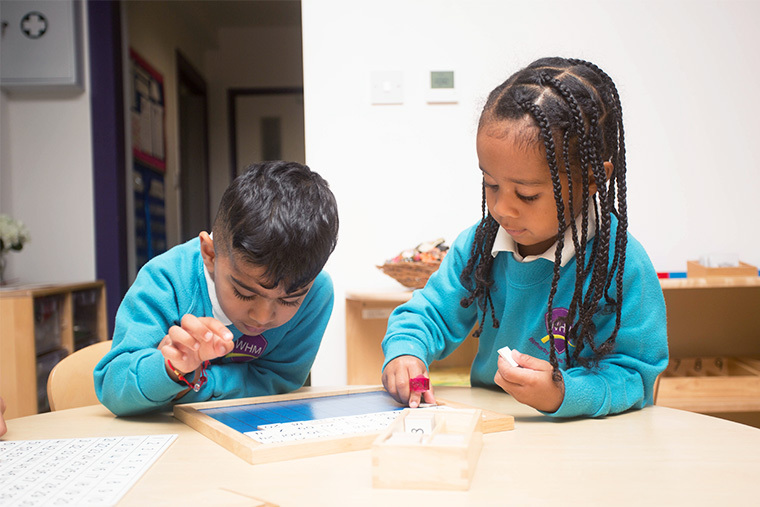 At Wetherby House Montessori, we follow the Montessori ethos and pedagogy, as established by Dr Maria Montessori. The Montessori Method stimulates the senses of the child; inspiring a passion for excellence, nurturing the imagination, and teaching timeless values. Maria Montessori emphasises the uniqueness and individuality of every child; extending this to the way they learn. Taking this to heart, we aim to provide an equally unique experience for each child, ensuring that they are able to be everything they are able to be. © 2019 Wetherby House. All rights reserved.